March 3, 1973 William Delouis Watson, the first African American to win the United States decathlon championship, died. Watson was born December 18, 1916 in Boley, Oklahoma, but raised in Saginaw, Michigan. In his senior year, Watson was elected captain of the track team, the first African American captain of any sports team in U. of M. history. In 1940, he became the first African American to win the U. S. decathlon championship. He repeated as champion in 1943. Watson joined the Detroit Police Department in 1941 and served until his retirement in 1966. 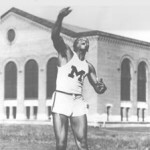 He was posthumously inducted into the University of Michigan Athletic Hall of Honor in 1982. ← March 2nd in African American History – Frank E. Petersen, Jr.